Add our store to your favorites and receive exclusive emails about new items and special promotions! 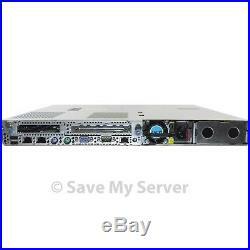 HP Proliant DL360 G6 Server Dual Xeon E5520 QC 2.26GHz 12GB 2x 146GB P410 1PS. At SaveMyServer we put our heart into our business and stand behind our products. We want you to be satisfied. HP ProLiant DL ProLiant DL360 G6. 2 x Intel Xeon Quad Core 2.26GHz E5520 5.86GT/s 64-Bit Processors. 12GB TOTAL = 6x 2GB DDR3 Memory Installed - 18 Slots Available. 2 x HP 146GB 10K SAS 2.5 Hard Drive. Riser Board with 2x PCIe (4-x4) (2-x4). Single 750W Power Supply Unit - Power Cord Not Included. 4 x 2.5 SAS/SATA Drive Bays. Onboard Dual Gigabit Network - 2 Ports Total. Embedded ATI ES1000 with 64MB SDRAM. 410 Smart Array SAS RAID with BBU. Windows 2008 Server Evaluation Edition Only (installed for our testing purposes). Software Media or Licenses are not included. If this happens, don't worry, we will stand behind our products! We cannot guarantee compatibility with your equipment or software. On one hand, we see a demand for affordable servers; other businesses need to handle server inventories they wont be using. SaveMyServer is the solution to both challenges, as an asset management company that carries out the entire remarketing process. SaveMyServer is also a green recycling company. While remarketing used servers keeps them from prematurely crowding landfills or storage, sometimes parts are broken or out-of-date. In those instances, SaveMyServer recognizes the continued need for proper disposal. Whatever we cant use, we recycle. SaveMyServer Item Information: 10AA - AutoAdmin - 8604 qid: 1256. 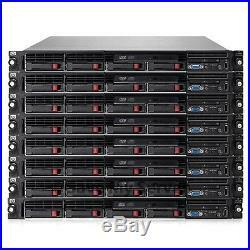 The item "HP Proliant DL360 G6 Server Dual Xeon E5520 QC 2.26GHz 12GB 2x 146GB P410 1PS" is in sale since Wednesday, December 6, 2017. This item is in the category "Computers/Tablets & Networking\Enterprise Networking, Servers\Servers, Clients & Terminals\Servers".